This fall more than 500 Capital Region residents vowed to make a difference and make history by taking strides against Breast Cancer. Warren County will do its part to will raise money for cancer research. 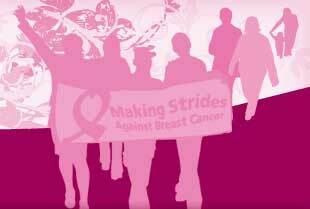 On October 24, 2010 the 2010 Making Strides of Warren County walk will be held, starting at Queensbury High School. The 5K, non-competitive walk will be held at various locations throughout the state from September through October. The event is sponsored by NYSUT. This year will be the organization's ninth year as the flagship sponsor and the organization hopes to raise more than $1 million. At least 13,000 NYSUT members participate in the walks each year. This effort was made apparent 3 years ago, when NYSUT became the first organization to raise $1 million for the fight against cancer in a single year. They are still the only organization to top that mark and have continued to do so for the past two years. Are you a survivor? There will be a Survivor Tent to celebrate and honor all participating breast cancer survivors. Come to the tent pick up a special t-shirt, meet our staff, and meet other survivors. Survivors are also invited to the front of the crowd of walkers and to be a part of the ribbon cutting ceremony. This event is for a great cause! So get your friends, get involved, and help in the fight against cancer. You can register as an individual or as a team. Registration can be made by phone or online. The event will be rain or shine and glass bottles are not allowed. For more information please call the American Cancer Society at 1-800-227-2345. What: The 5K Making Strides Against Cancer walk. For more information please call the American Cancer Society at 1-800-227-2345.